With the last few years seeing a growing trend of slot tournaments gaining in attendance, payouts, and attention all around, Liberty Slots has been right on top of the trend. This month, from May 1st through 31st, Liberty Slots is hosting the May Money Maker slot tournament with a prize pool that has topped out at $30000. When all is said and done at the end of the month, the top player will pull $5000 from that pot with the second place gambler taking home $1500. These great prizes are the aim of more than one thousand players who will be drawing from the remainder of this collective amount. 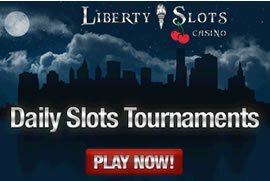 Liberty Slots is no newcomer to the world of slot tournaments with their past events having drawn thousands of players to the huge prize pools which have also made it into the five figure range. Their site has an impressive regular player base for the many classic and video slots they offer, such as Grail Maiden which is the featured slot for this most recent tournament. This is the first Liberty Slots tournament that has been played using the Grail Maiden slot game so there's a feel of excitement and novelty attached to this latest run. Grail Maiden centers on the quest of a knight who is looking to rescue a princess, his damsel in distress. Players who are fans of mythology will quickly notice that the mechanics, look, and feel of the game are reminiscent of Arthurian legends, applying a further appeal. This isn't the only event happening in the month of May as Liberty Slots is hosting a collection of smaller tournaments throughout for those who want to improve their play for future challenges, play in a less stressful field, or have a different favourite game. These side tournaments running alongside the major May Money Maker with the combination of amazing game selection are a big contribution to Liberty Slots' success allowing the relatively small site to have made such huge leaps and bounds in the online gambling market.